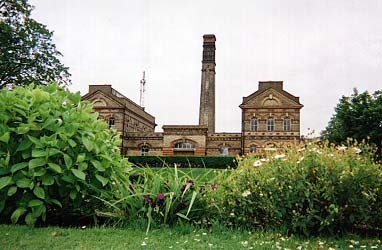 Photograph of the Engineerium, Hove. “As a young PC, I saw children climbing into the grounds of the Goldstone Pumping Station. When looking for them, I met a waterboard man who showed me the magnificent Eastern and Anderson Beam Engine, looking like a new pin. It pumped 150,000 gallons of water per hour from a 50 metre deep well. Installed in 1875, it was a magnificent example of Victorian engineering. The workman was proud, but sad about plans to demolish the Station. I am having some difficulty getting onto the Engineerium website…I am the great granddaughter of Benjamin Adam who was the resident engineer at the Goldstone Works. I think he started in 1893. I have just transcribed what appears to be his resume and wondered if the museum might be interested. I know the family lived at the Works when my grandmother was growing up and wondered whether there might be any pictures of the family home or other written information on the family. This building puts modern buildings to shame! The brickwork, the layout, the interior, the finishing touches, the cleanliness and the feel for the place. Built with passion and thought. Shame Mile Oak and Waterhall and many others have gone, would have been successful museums or flats now? or maybe an Engineerium! I was really saddened to hear the news about the sale of the contents of the Engineerium. Surely somthing can be put in place to carry on running it. Why do we keep breaking up collections of things that have built our countrys history. Surely it has to be classed as a heritage site.?? I’m so pleased to make my comments a little later than the others and to say how very happy I am that this wonderful Engineering museum has been bought and saved for posterity. It would have been helpful to have times of opening and a telephone number for planning a visit. Thank goodness for Mike Holland, CEO of Cherrywood Investments for purchasing the Engineerium. Thank you Mr Holland. Dear Sirs, Please can you tell me when the Museum is to be reopened .I am a member of the VMCC & Mazda MX5 clubs and wish to plan group visits when possible . Looking forward to revisiting. My grand father worked for Brighton Water. In the late 1950s to early 60s they lived in the house on the site. At the age of eight, I fished the cooling pond for carp and had access to the steam pump engines and underground wells. It was kept spotless. I later returned in my 40s to find some of the equipment had been removed. A wonderful place to play. I hope the Engineerium is reopened. I often used to walk past it as a child on the way to Hove Park but rarely visited the museum as I didn’t understand the significance of the site back then.